Kitty: Ok, where do you want me? Let’s get this over with woman. 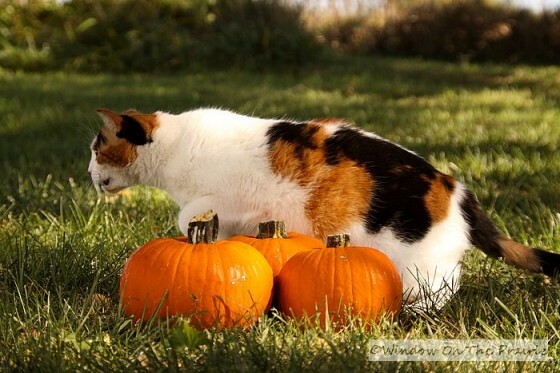 Me: Ummm….right there behind the pumpkins, please. Ok, now eyes front. Me: Wonderful! Now just stay there for a few more. Me: Hey! Come back here! Kitty: Hot dog! 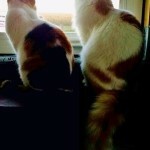 There are birds over there! Me: Don’t go far now….. So I got the pie pumpkins back in the house to make pumpkin puree. I only wanted to take a nice pic of them with Kitty providing scale so you could see their size. Pie pumpkins are smaller than carving pumpkins. I got these at Wal-Mart, and they had little stickers telling me they were “Pie Pumpkins”. 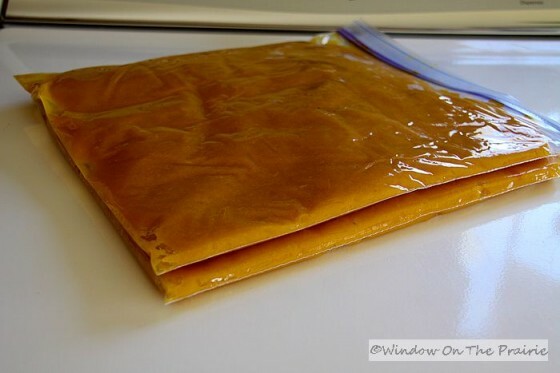 Last year, I learned to use pumpkin puree instead of canned pumpkin to make pumpkin pie, and will never go back. Much better flavor than canned I think, and it’s just a fun thing to do. 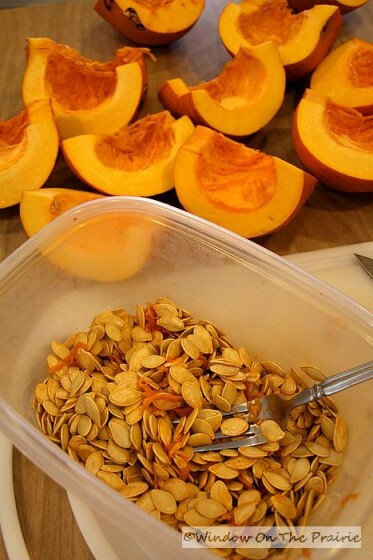 First, I cut up the pumpkins into quarters, cut off the stems, and removed the seeds with a fork. Later in the week, I’ll show you how to roast these for a tasty snack. Next, all that orange stringy stuff had to be removed. I did this with a cheese knife because I forgot I did it with an ice cream scoop last year. I got the job done with the knife, but the scoop worked better. That’ll teach me not to referring back to my own blog. Ha. 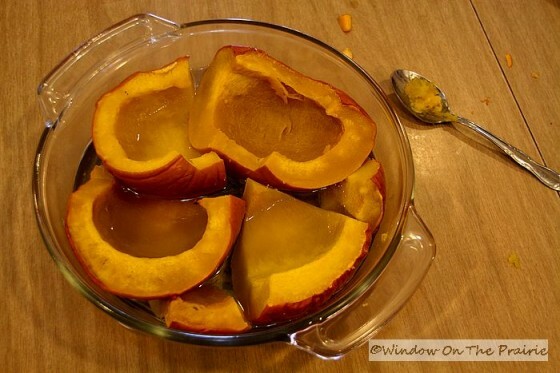 Then I fit as many pumpkin pieces as I could into a casserole dish, added a couple inches water, and put it in the microwave for about 12 minutes. 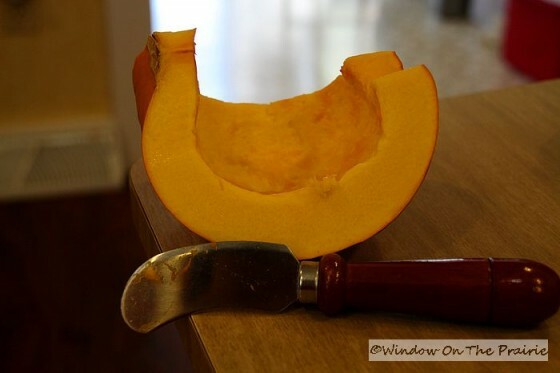 You want the pumpkin to be soft and easily scoop off the rind. Just keep an eye on it as your microwave time may vary. When it’s done, let it cool some so you can touch the pieces without getting burned, and then use a spoon to remove the flesh from the rind. 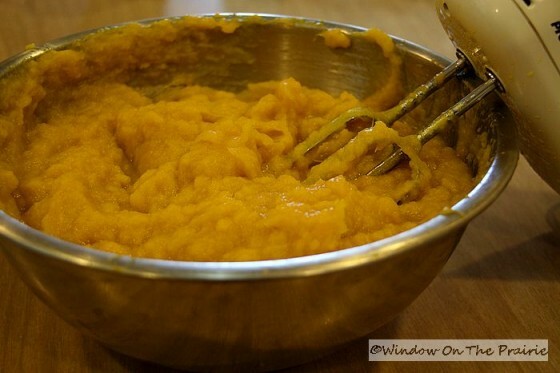 Then you can use a stick blender, hand mixer, or blender to puree the pumpkin. If you see water puddling in the puree after it sits for a little while, you can strain it off. 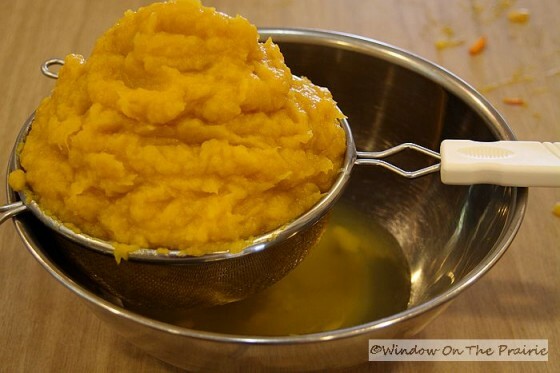 Your fresh pumpkin puree will keep in the fridge for 5 days, or in the freezer for 6 months. Hey, if you haven’t done this before, give it a try. 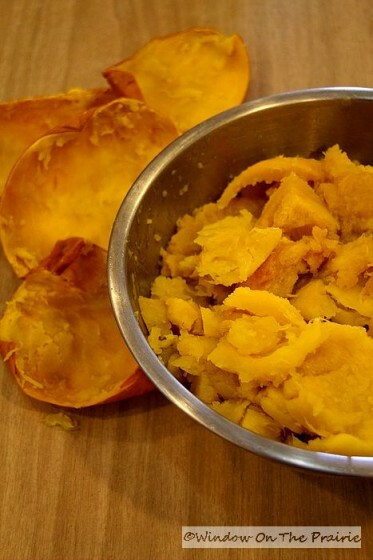 It’s a fresher, tastier alternative to canned pumpkin. Plus, you can roast the seeds for snacking. And I’ll show you tomorrow how to do that. 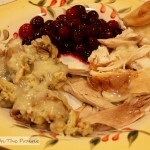 I love your blog and your homestyle recipes! Every one I’ve tried was a keeper. I’ve never seen a tool like the one you used to scoop out the pumpkin seeds (but I WANT ONE). 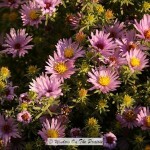 Do you know what it’s called? Yum! 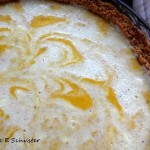 That looks wonderful and I am not really fond of pumpkin pie although I usually eat a piece once a year. You make it look so easy. 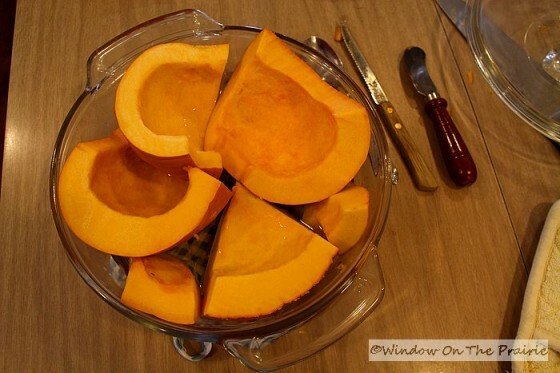 I never knew that about the smaller pumpkins being best for pie. 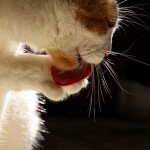 How nice of Kitty to do eyes forward for you – and a beautiful shot. 🙂 As always, I’m impressed with the time you take to do things right… thanks for the tutorial! Very nice! Who knew? You said you got them at Walmart…hmmmm now I have to look for them in mine too. 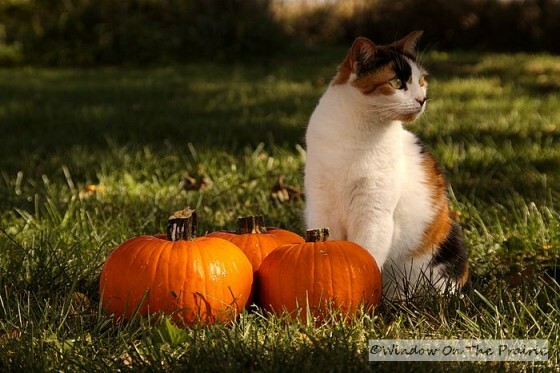 I love pumpkin and your furry pumpkin makes a lovely model with them. 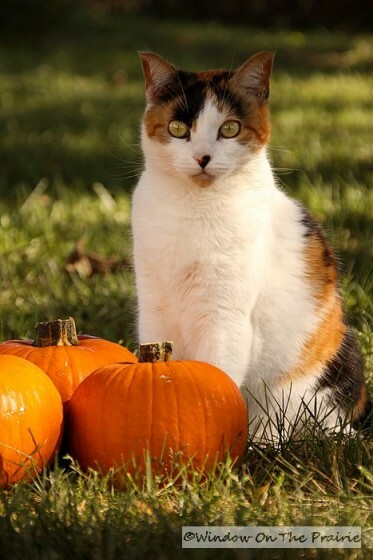 When you find them they should have a sticker on them saying “Pie Pumpkin”. My guys LOVE punkin seeds. .and they make ’em every year. .I’ll be eager to see how you do it! 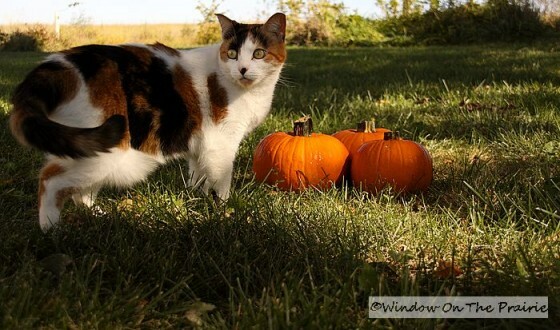 Love the pic of kitty with the pumpkins! 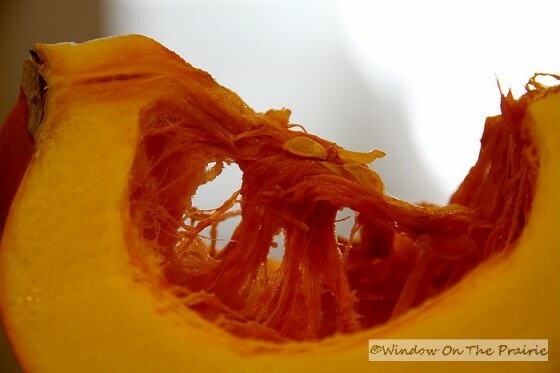 I love using fresh pumpkin, it’s great it freezes so well! I think I might keep a few cans around though because it’s about this time of year that no one has pumpkins or canned pumpkins and my pumpkin from last year is all gone. I know this is a little random, but would you happen to have any good multigrain bread recipes you’d want to share with us? I’m striking out online and every bread of yours that I’ve tried I really love. I make bread a lot more often than I used to now. I’ve not made a multi-grain bread, but I’ve been in a bread making mood lately, so I’ll make a multi-grain and share with you soon. Thanks Maegan! I love your kitty posts 🙂 Makes me want one again. 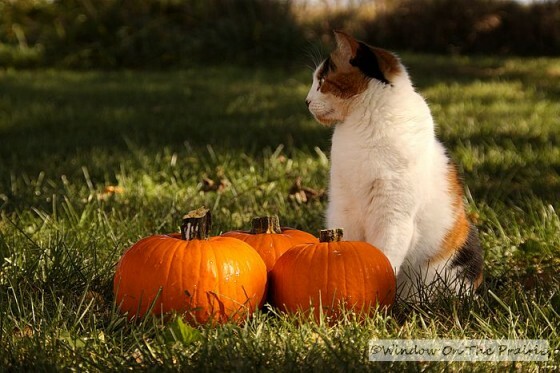 I’ve been stocking up on canned pumpkin as I find it, but now I think I’ll try to make my own at home. I’ll at least give it a try so I can say I did it, & for comparison! I will try that next time. What temp do you use in your oven? Thanks Kerry! Tinned pumpkin always tastes slightly “metallic” to me, so I am going to do as you suggest and roast my own and freeze it. I DO have one question: when you use the fresh pumpkin instead of the tinned is it more watery even after you drain it? Do you have to compensate for any extra water when you use it in bread or cake recipes? After it’s strained, I use it just as I would canned. The water comes from it sitting in water as it cooks. Thanks Kit!